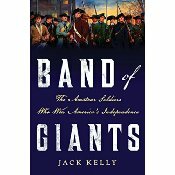 Band of Giants by Jack Kelly | What Would The Founders Think? Band of Giants is a book about great characters who overcame, what seems in retrospect, nearly insurmountable odds to beat the world's foremost military and naval power. In the space of a short few hundred pages author Jack Kelly takes the reader through the War of Independence from start to finish, lingering here and there to illuminate some of the fantastic characters who achieved the seemingly impossible. Kelly points out that men like Hamilton, Lafayette, Henry Knox, Anthony Wayne, and Nathaniel Greene, to name a few, "... had fought with the intensity of youth. They had taken the risks that come easily to the young, had seen with the clarity of youth, had dreamed the dreams of youth. They beheld the phantasmagoria of possibilities that is visible only to the young. They had persevered, they had won. They were, as Lafayette had long ago marveled, "a band of giants."" Some of these men were giant in stature as well as character. Daniel Morgan, for example, began his military career serving as a wagoner or teamster, hauling supplies during Braddock’s disastrous campaign to oust the French from Fort Duquesne. Morgan was a big guy, more than 6′ tall and strongly built. At one point during the expedition, Morgan quarreled with a British officer and knocked the man down. A quick drumhead court-martial sentenced the teamster to five hundred lashes. Morgan was tied to tree and whipped. In his telling, the number was 499 because the drummer miscounted and Morgan “did not think it worthwhile to tell him of his mistake, and let it go so!” He would bear the scars throughout his life. This same rough-hewn, poorly educated, teamster, would go on to inspire men in battle with Benedict Arnold (before his perfidy), and employ brilliant tactics later at the Battle of Cowpens – as a general! His tactics are still studied today. One has to wonder if Morgan and Washington interacted much back in 1755, as Washington was ostensibly an officer and Morgan was a mere waggoner. As a provincial colonel who knew the terrain, Braddock allowed Washington to join the army as a volunteer and attached him to his staff. It was also at this time that Washington became acquainted with other future allies and adversaries, such as Horatio Gates (future hero of Saratoga), Charles Lee (the man Washington relied upon and then famously denounced as a “poltroon”) and the future military governor of Massachusetts, Thomas Gage. In some respects this reader thought it reminiscent of Jeff Shaara’s Gone For Soldiers. Shaara’s novel details the Mexican-American War, in which men like Grant, Longstreet, Lee, and many others fought together, only to be on opposite sides during the Civil War 20 years later. Within 20 years of Braddock’s March (review), Morgan, Washington, Gates, and Lee would go on to play significant roles in the American Revolution, and are included among the “Band of Giants,” (although, Charles Lee might not have been one that author Jack Kelly had in mind). But, it wasn’t just veterans of the French and Indian War, about whom Kelly writes. There were other, younger men, truly amateurs as denoted in the book’s subtitle, who made all the difference. …gained a reputation as a teenager as one of Boston’s toughest street fighters, something to brag about in a city populated by fist-hard seamen and muscled dock workers. … his mother apprenticed him to a firm of booksellers, where an indulgent proprietor let him continue his studies with borrowed tomes. Knox read Plutarch’s lives of great men, taught himself French, and absorbed the ideas of Enlightenment thinkers. At seventeen, Knox joined the artillery company branch of the provincial militia. The handling of great guns, as exacting as it was muscular, engaged both his intellect and his physical prowess. The science of artillery incorporated mathematics, mechanics, geometry and chemistry. The man in charge of this militia (before the Revolution, of course), was Adino Paddock, a staunch Tory. This man passed on techniques learned from British artillery officers. This knowledge, combined with his studies from books, would come in very useful indeed. In 1770, Knox witnessed the Boston Massacre and later testified as an eyewitness during the trial, at which future President John Adams successfully represented the British “perpetrators.” By that time, the die was probably cast for Knox. Knox would later play critical roles in the Revolution, and apply his knowledge. Another “giant,” if not physically, certainly mentally, was Knox’s friend Nathaniel Greene. Although an unlikely pair, the two shared a patriotic fervor, and both were autodidacts. The asthmatic, partially lame Greene was fascinated with military science, his Quaker upbringing notwithstanding. Because Greene’s knowledge of military theory outstripped that of his fellow militiamen, he expected to be elected an officer. But his comrades could not countenance a lieutenant with a limp at their head. They voted him down. It was, for the sensitive Greene, a “stroke of mortification.” “Nobody loves to be the subject of ridicule,” he opined. His confidence shaken, he almost quit the unit, but instead opted to soldier on as a lowly private. In this “age of amateurs,” as Kelly rightly denotes it, anything seemed possible. In a time when a retired printer like Benjamin Franklin could make breakthrough discoveries in science, it didn’t seem impossible that soldiers armed with book learning could challenge an empire. … Greene, whose limp had barred his way in the militia, would soon be appointed the youngest brigadier general in the continental army. From private to general in a month — his dizzying ascent was a sign of the desperate times. It is not possible or practical to cover all of the men that appear in Kelly’s cast of characters, or even to adequately summarize the accomplishments of even these few, in the space of a review. Indeed, even Kelly doesn’t cover them all. For instance, while he does feature “Mad Anthony Wayne,” he doesn’t mention his friend John Barry. 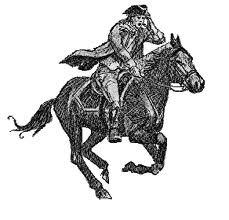 Harry “Light Horse” Lee makes an appearance, but there is only a brief a mention of William Washington. This is not to fault Kelly in the slightest, but it is further evidence that Lafayette (himself one of the “giants”) was right in his assessment. These men were tough, resilient, and plentiful on the ground. After reading this book, one has to wonder how such men come to be spawned … and where they’ve all gone today.